Go to Accounting, then D - Record Bank Deposits. Each time a payment is entered into a customer's account, the payment is posted automatically as a debit to Account 1010 - Cash in House. Entering a bank deposit moves the desired amount from the cash account to the general ledger's bank account, mirroring the physical steps of taking a deposit from the dealership to the bank. 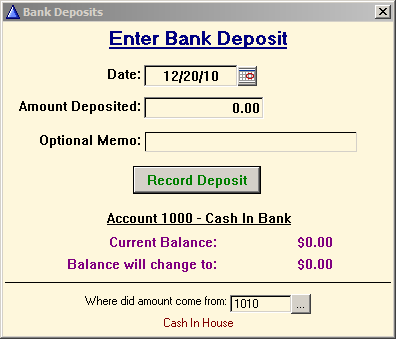 By default, the deposit amount comes from Account 1010 - Cash in House. There may be situations where the default account must be changed. This account is changed by clicking the button at the bottom-right of the screen, then selecting the correct account from which to transfer the money. Deposits may only come from asset, liability, or equity type accounts. decrease (or credit) the amount of money in the account if the deposit comes from an asset account. increase (or credit) the amount of money owed in the account if the deposit comes from a liability account.